As seen below, S&H 800-500-7090 has provided Los Angeles County jail information. Below, we’ve gone ahead and listed all of the Los Angeles Jails. Here at S&H Bail Bonds, we’ve tried and created a website that caters to the individual who is either in need of a bail bond or has a bail bond already and just needs additional information. The list is for your viewing only, please don’t copy and use elsewhere. 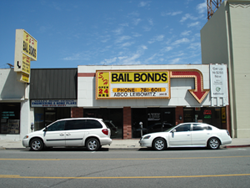 As always, you can call us 24 hours a day, 7 days a week for any Los Angeles bail bonds needs or for any bail bond information.